I think that most people would agree that homemade ice cream is way better tasting than most of the stuff you find in the grocery stores. It has a shorter ingredient list (aka no chemicals or preservatives) and a richer, creamier flavor. Also, when you make your own ice cream you have the freedom to create any flavor that you want which is a lot of fun. I always always use the same recipe for the base of the ice cream when I'm playing around with different flavors for a number of reasons. It's an easy recipe to add ingredients to and it can be adjusted to suit your tastes. This is a custard based recipe which means that milk, cream, and half of the sugar are heated until the sugar dissolves. Two eggs plus the other half of the sugar are whipped until they reach the ribbon stage either in a mixer or with a whisk. 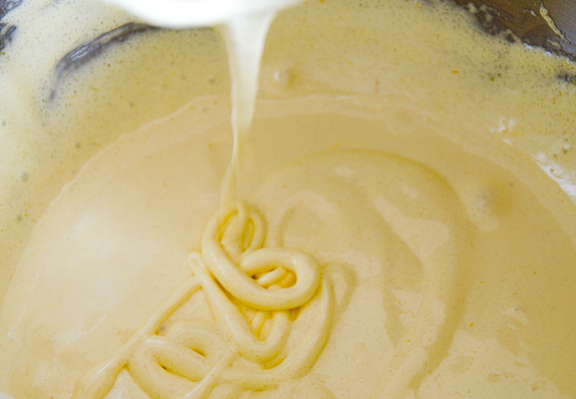 The hot milk is the slowly beat into the eggs to prevent them from curdling and then the custard goes back into the pot and simmered until it thickens. There are a few reasons why I like making custard based ice creams instead of ones that you don't need to cook or add eggs to. The first is that eggs add a ton of flavor to the ice cream and a richer texture. The second is that the cooking process provides more opportunity to add different flavors to your ice cream.You can infuse the milk with flavors while you heat it up, melt candies in it, cook pieces of fruit in it etc. Since half of the sugar goes into the milk and half gets whipped up with the eggs it also makes it easy to adjust the sweetness of your ice cream. If you add candies or fruit to the milk as it is heating up and decide after tasting it that it is sweet enough then you can cut down (or cut out) the sugar that you were going to add to the eggs. When you make this recipe without any changes you get a creamy vanilla flavor with a texture similar to Haagen Dazs. If you want something extra decadent that is more suitable to be served in small portions then you can replace some of the whole milk with extra whipping cream. The recipe is flexible and holds up well to tweaking and changes. For my buttered popcorn ice cream I started with the vanilla base but then I soaked buttered popcorn in the hot milk and cream mixture before beating it into the eggs. To make liquorice ice cream I omitted the sugar from the milk mixture and melted liquorice toffee into the hot milk and cream before beating it into the eggs. You can do this with any candy or toffee that will dissolve in hot milk. Once the custard has thickened then it goes in the fridge until it has cooled completely. I find that its best to leave it overnight because most ice cream makers work better when everything is as cold as possible. After churning the ice cream is usually the consistency of soft serve and you can either enjoy it like that or put it in the freezer to firm up so that it can be scooped. I know that I'll be using this base to try some Christmassy flavors soon! 1. Combine milk, cream, 1/2 cup sugar , vanilla and the salt in a heavy bottomed sauce pan. Heat until almost boiling and then remove from heat. 4. Chill custard in fridge with plastic wrap placed directly on the surface to prevent a skin from forming. I like to chill mine over night. Then churn in an ice cream maker and either enjoy it as a soft serve ice cream right away or put it in your freezer to firm up and enjoy as scoops of ice cream. Even though it's gotten much colder here, ice cream sounds so good! I remember making ice cream as a kid but it was just cream, sugar and vanilla that we tossed around in a big bag of ice and salt. Yours sounds and looks much tastier! I agree with Mary, you always explain stuff really well! my mum just got back from Belgium armed with loads of Speculoos paste and I'm dying to make ice cream with it. Defo going to use your recipe! Wow your ice cream looks super creamy! I haven't tried using eggs but am tempted to pull down the ice cream maker from winter storage after reading this. Buttered pop corn is a favorite treat and it's tempting to add it to my other fave! I just got an ice cream maker and have been intrigued by all of the ice cream posts everywhere! Thanks alot for this recipe, I will use it for inspiration to make a low carb version as soo as i manage to get an icecream maker. We feel as if we don't have a "His Ice Cream" spoon, then we don't have to share with him. And your ice cream looks so heavenly, we don't want to share. It's an easy recipe to add ingredients to and it can be adjusted to suit your tastes. Looking so appealing this ice cream..!! I am really so impressed to get this post article. Really I enjoyed this post very much. Thanks and keep it up..
What do you do if it curdles in the last Cooking step?